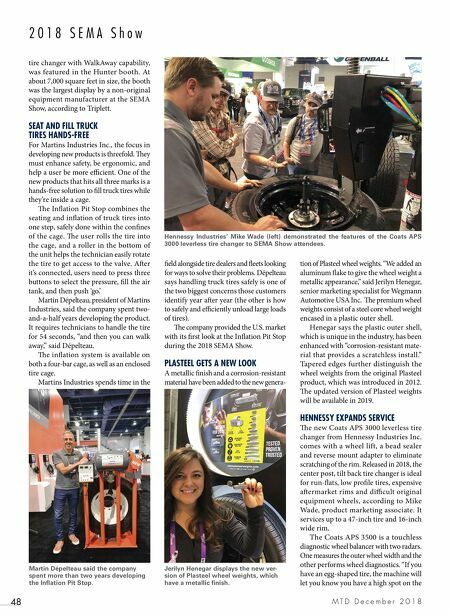 M T D D e c e m b e r 2 0 1 8 48 2 0 1 8 S E M A S h o w tire changer with WalkAway capability, was featured in the Hunter booth. At about 7,000 square feet in size, the booth was the largest display by a non-original equipment manufacturer at the SEMA Show, according to Triplett. 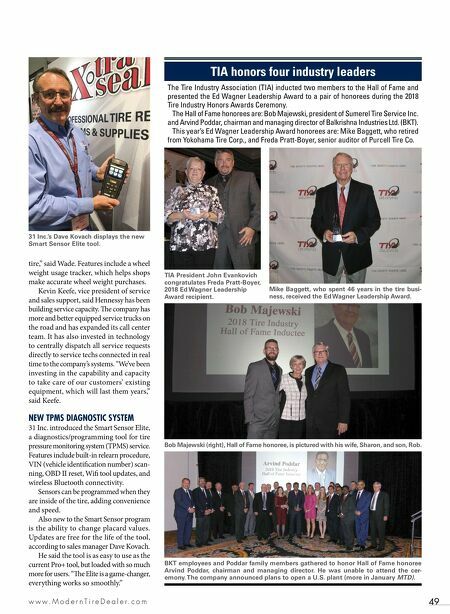 SEAT AND FILL TRUCK TIRES HANDS-FREE For Martins Industries Inc., the focus in developing new products is threefold. ey must enhance safety, be ergonomic, and help a user be more efficient. One of the new products that hits all three marks is a hands-free solution to fill truck tires while they're inside a cage. e Inflation Pit Stop combines the seating and inflation of truck tires into one step, safely done within the confines of the cage. e user rolls the tire into the cage, and a roller in the bottom of the unit helps the technician easily rotate the tire to get access to the valve. Aer it's connected, users need to press three buttons to select the pressure, fill the air tank, and then push 'go.' Martin Dépelteau, president of Martins Industries, said the company spent two- and-a-half years developing the product. It requires technicians to handle the tire for 54 seconds, "and then you can walk away," said Dépelteau. e inflation system is available on both a four-bar cage, as well as an enclosed tire cage. Martins Industries spends time in the field alongside tire dealers and fleets looking for ways to solve their problems. Dépelteau says handling truck tires safely is one of the two biggest concerns those customers identify year aer year (the other is how to safely and efficiently unload large loads of tires). e company provided the U.S. market with its first look at the Inflation Pit Stop during the 2018 SEMA Show. PLASTEEL GETS A NEW LOOK A metallic finish and a corrosion-resistant material have been added to the new genera- tion of Plasteel wheel weights. "We added an aluminum flake to give the wheel weight a metallic appearance," said Jerilyn Henegar, senior marketing specialist for Wegmann Automotive USA Inc. e premium wheel weights consist of a steel core wheel weight encased in a plastic outer shell. Henegar says the plastic outer shell, which is unique in the industry, has been enhanced with "corrosion-resistant mate- rial that provides a scratchless install." Tapered edges further distinguish the wheel weights from the original Plasteel product, which was introduced in 2012. e updated version of Plasteel weights will be available in 2019. HENNESSY EXPANDS SERVICE e new Coats APS 3000 leverless tire changer from Hennessy Industries Inc. comes with a wheel lift, a bead sealer and reverse mount adapter to eliminate scratching of the rim. Released in 2018, the center post, tilt back tire changer is ideal for run-flats, low profile tires, expensive aermarket rims and difficult original equipment wheels, according to Mike Wade, product marketing associate. It services up to a 47-inch tire and 16-inch wide rim. The Coats APS 3500 is a touchless diagnostic wheel balancer with two radars. One measures the outer wheel width and the other performs wheel diagnostics. "If you have an egg-shaped tire, the machine will let you know you have a high spot on the Martin Dépelteau said the company spent more than two years developing the Inflation Pit Stop. Jerilyn Henegar displays the new ver- sion of Plasteel wheel weights, which have a metallic finish. Hennessy Industries' Mike Wade (left) demonstrated the features of the Coats APS 3000 leverless tire changer to SEMA Show attendees.